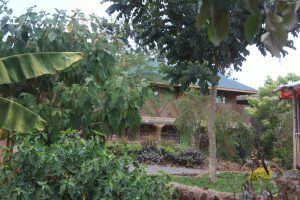 Dr. Karambu Ringera and International Peace Initiatives (IPI) created an ecological center with multiple facets and goals. There is a working farm, camp sites and eco huts for lodging, and large outdoor meeting spaces. Still under construction is the Eco Center, which will be able to host large meetings and groups when complete. First, Tiriji is a farm using an Integrated Land Use Design (ILUD), so everything is grown in a holistic way, combining traditional agricultural practices and permaculture principles. Plants are grown together based on what will most benefit them, the soil, and the atmosphere. For example, plants that need more nitrogen are interplanted with vegetation that adds nitrogen to the soil. 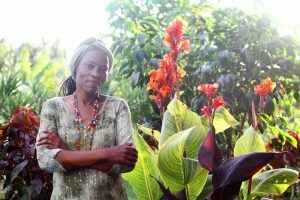 Karambu’s goal is to create a “food forest” and a micro-climate, and to be able to produce food year round. The farm is IPI’s response to the modern agribusiness approach to farming, which has severely damaged both Kenya’s cultural and practical approach to food production, as well as the country’s environment. Tiriji is also an educational space, where both local women and international guests attend workshops to learn about ILUD and how they can incorporate it to make their lives more sustainable. In doing so, Tiriji serves as one of many IPI programs focused on the personal and societal empowerment of women. The center is also a place of rest and retreat for IPI guests, and camping sites and eco huts have been added for the visitors who are seeking a minimal carbon footprint experience. All the construction projects used local building materials as much as possible. The farm is a work in progress, but progress is made on a daily basis.